Cindy and her husband recently visited Dallas and gave me a Cloud Dome to test. I believe jewelry photography as we previously have know it has changed forever. 1) It is almost impossible to get a hot spot on jewelry. The lighting can be changed from the outside of the dome, and the changes are visible in your viewfinder. 2) I can do drop shadows with it, for both stones and for jewelry pieces. 3) The dome is sturdy and replaces a tri-pod. I have used times of 2 seconds with no noticeable movement in the resulting picture. It allows digital cameras (I used a Nikon 990) to use Aperture Priority, set the Aperture to 9.9 for greater depth of field at really closeup distances. 4) It is simple, fast, portable, and light weight with nothing else to buy. 5) It fits most all digital cameras and Cindy is developing a bracket for larger cameras. As soon as its finished, I'll test it with slide film and my Nikon F5. The next page has pictures of my setup, how I did drop shadows, and actual photographs from inside the Dome. 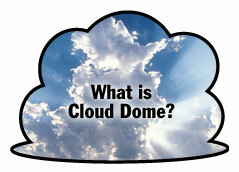 I dont think you can go wrong with a Cloud Dome, its professional lighting for amateur photographers.